Probably the only thing better than reading good books is talking to the people who write them. 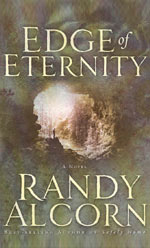 That’s why I was so excited to have the chance to meet and talk with Randy Alcorn, author of Edge of Eternity. This is a man of many talents—he’s been a pastor and a writer of nonfiction, and he now directs the efforts of a national nonprofit organization. But many people will recognize Alcorn’s name as the author of Deadline and Dominion, two novels that have topped the Christian best-seller list for several years. Why would someone so involved in such serious pursuits take the time to write novels? For Randy Alcorn, the answer is simple. What does he hope readers will take away from Edge of Eternity? One of my favorite things about Randy’s new book is the passages where the veil between heaven and earth is lifted, and we, the readers, see things as they really are. I asked Randy if he thought this happened in real life as well.